Vampire squid, Vampyroteuthis infernalis (Chun, 1903) – which translates to “vampire squid from Hell”, are the only known members of the Order Vampyromorphida, the seventh order in the Class Cephalopoda and they combine features from both octopodiformes (octopuses) and decapodiformes (squid, cuttlefishes, etc.) suggesting it may represent an ancestral line between the two groups (Robison et al., 2003). Vampire squids, which are not technically true squids, are named for their blue eyes, reddish-brown skin and webbing between their arms. They are small “squids” reaching maximum lengths of 28 cm (with mantle lengths of typically 7.9-12.1 cm (Robison et al., 2003)). Like true squids, there is sexual dimorphism in size: females are larger than males. Vampyroteuthis infernalis has eight long arms and two filaments that extend well past the total length of their body which they can retract into pockets found in their webbing between their arms. They were at first thought to be arms, however they are different in structure and composition, therefore they are believed to be a uniquely derived trait of this amazing species. Suckers are found on the distal half of their arms. There are two fins on the dorsal (upper) surface of their mantles. An interesting phenomenon in this squid is the metamorphosis of the size, shape, and position of the fins as they grow. When their mantles are 15-25 mm in length, a second pair of fins begins to develop in front of their first pair. When the new pair reaches maturity, the original pair is then reabsorbed. The new fins change the vampire squid’s swimming style from jet propulsion to fin propulsion. 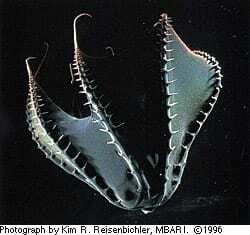 The body composition of the vampire squid is similar to that of a jellyfish. They have very large eyes; proportionally they have the largest eye-to-body ratio of any animal in the world. Vampire squid have black chromatophores interspersed with reddish-brown ones. They do not function like the chromatophores in true squid because this species does not have the muscles that control color change. They also lack the ink sacs found in true squid species. Vampire squids are well-adapted to live in deep sea environments with photophores, large circular organs found on the posterior (rear) end of each fin and distributed on their mantle, a funnel, head, and aboral surface (the surface opposite the mouth (or oral surface)), that produce luminescent clouds of glowing particles that last between 2-9 minutes (Grzimek 1972, Wood and Ellis 1999, Wood 1999). Because of their weak muscles, vampire squid were thought to be slow swimmers, however they can actually swim rapidly for short periods of time using their fins. They also have a highly-developed statocyst, an organ that aids in balance, that gives them agility. This geosensory organ consists of a sac-like structure and numerous innervated sensory hairs. A statolith is found in the sac-like structure that possesses inertia causing the mass to move when accelerated. This response to gravity activates neurons providing feedback to the squid on its orientation, which aids in balance. The swim speed of the vampire is estimated at two body lengths/sec, which the animal can maintain for short distances. When threatened, the vampire squid moves its fins toward the funnel and emits a jet of water from the mantle. A defensive posture has been described as a “pineapple posture” when the arms and web are spread over the head and mantle. This position protects the head and mantle and the animal is further camouflaged by its dark body. The arm tips and the base of the fins also luminescent by glowing or flashing, which is usually followed by an escape response. The vampire squid will also flail its arms to confuse predators by apparently making it difficult to determine the squids exact location (Portner, et al. 1994, Seibel, et al. 1997, Young 1999, Wood 1999). 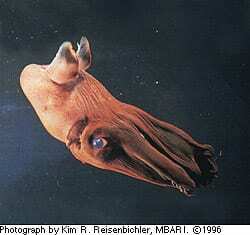 Vampire squid are found in the temperate and tropical regions of the ocean. They occupy meso- to bathypelagic depths where very little light penetrates between 300-3,000 m and are typically found between 600-1,200 m. Their north-south distribution is localized between the 40°N-S latitudes where the water is 2-6°C. Studies conducted at the Monterey Bay Aquarium Research Institute in California revealed that Vampyroteuthis infernalis is confined to the oxygen minimum layer in the Monterey Bay at depths between 600-900 m and oxygen levels of around 0.4 ml/l. The vampire squid is a carnivorous animal and has been reported to feed upon copepods, prawns and cnidarians (Robison et al., 2003). They have a very low mass-specific metabolic rate because of their decreased reliance on locomotion for escaping predators and capturing prey. Sensory filaments and light-producing organs at the arm tips (Robison et al., 2003) are used to attract/find food and escape predators in the deep sea. The squid uses one filament at a time to find its prey, then swims around in a circle hoping to catch the prey (Seibel, et al. 1998, Wood and Ellis 1999, Wood 1999). Vampire squid beaks have been reported from the stomachs of large, deep-diving fishes, pinnipeds (seals and sea lions) and whales as well as benthopelagic fishes (Robison et al., 2003). It is thought that spawning occurs in this squid’s deep water habitat. Like true squids, males likely transfer spermatophores to the female from their funnel. Female vampire squids are larger than the males and discharge fertilized eggs directly into the water. Mature eggs are fairly large at 3-4 mm in diameter and are found free-floating in small masses in deep water (Grzimek 1972, Young 1999). Vampire squid are not yet considered to be threatened or even slightly dangerous to humans. Robison BH. Reisenbichler KR. Hunt JC. Haddock SH. Light production by the arm tips of the deep-sea cephalopod Vampyroteuthis infernalis. Biological Bulletin 2003. 205(2):102-9. Grzimek, D. 1972. Grzimek’s Animal Life Encyclopedia. New York: Van Nostrand Reinhold Company. Portner, H., R. O’Dor, D. Macmillan. 1994. Physiology of Cephalopod Molluscs: Lifestyle and Performance Adaptations. Switzerland: Gordon and Breach Publishers. Seibel, B., E. Thuesen, J. Childress. 1997. Decline in pelagic cephalopod metabolism with habitat depth reflects differences in locomotory efficiency. The Biological Bulletin, 192: 262-278. Seibel, B., E. Thuesen, J. Childress. 1998. Flight of the Vampire: ontogenetic gait-transition in Vampyroteuthis infernalis (Cephalopoda: Vampyromorpha). The Journal of Experimental Biology, 201 (16): 2314-2324.